By GreenEyedLillies on January 19th, 2009 . Filed under: Contests, Home Decor, Kitchen . Why eat on a regular plate when you can eat on a cupcake?! 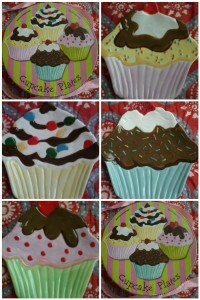 Four sweet and bright cupcake plates to be given away to one lucky cupcake. Leave a comment at The Cupcakes Club (not here on ATC) and random.org will choose a winner on 1/23/09. Perfect for a snack but why not use it to hold bracelets or rings or can be hung on the wall…use your imagination. Good luck! P.S. Be sure to check back at The Cupcakes Club to see if you have won! *If you are not the winner of this set…no worries you can get it here. 6 Responses to Cupcake Plates GIVEAWAY!!! So adorable. I have never seen plates like these before. I love to bake for my family and these would be so cute to use. What a lovely giveaway. Thanks for sharing! Be sure that you are entering your comment for the contest over at The Cupcakes Club. That is the only place you can win them. Ohhh these are super cute I wouldn’t hang em’ on the wall I’d use um’!